This article was first published in the SMPS Marketer – bimonthly journal by the Society for Marketing Professional Services (SMPS). With so many communication tools available, you’d think it would be easier than ever to get the word out about your firm. But one paralyzing obstacle gets in the way: EXECUTION. The reason? Often, the marketing plan itself was not developed with the realities of execution in mind. Incorporate these reality-check decisions during your planning stage to increase your chances of an executable plan. Knowing this freed marketing to create a plan focused on closing business already in the pipeline rather than a scattered plan that didn’t result in the new business the firm really wanted. Ask: Is the goal we stated the actual tangible result we want to see? If not, how can we refine the goal so that marketing can focus on what we really want to achieve? 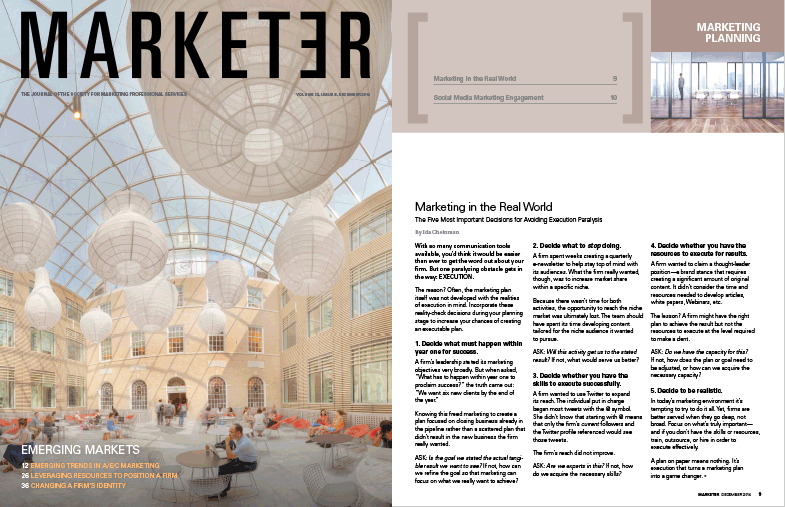 A firm spent weeks creating a quarterly enewsletter to help stay top of mind with its audiences. What the firm really wanted, though, was to increase market share within a specific niche. Because there wasn’t time for both activities, the opportunity to reach the niche market was ultimately lost. The team should have spent its time developing content tailored for the niche audience it wanted to pursue. Ask: Will this activity get us to the stated result? If not, what would serve us better? A firm wanted to use Twitter to expand its reach. The individual put in charge began most tweets with the @ symbol. She didn’t know that starting with @ means that only the firm’s current followers and the Twitter profile referenced would see those tweets. The firm’s reach did not improve. Ask: Are we experts in this? If not, how do we acquire the necessary skills? A firm wanted to claim a thought leader position – a brand stance that requires creating a significant amount of original content. It didn’t consider the time and resources it takes develop articles, white papers, webinars, etc. The lesson? A firm might have the right plan to achieve the result but not the resources to execute at the level required to make a dent. Ask: Do we have the capacity for this? If not, how does the plan or goal need to be adjusted, or how can we acquire the necessary capacity? In today’s marketing environment it’s tempting to try to do it all. Yet, firms are better served when they go deep, not broad. Focus on what’s truly important – and if you don’t have the skills or resources, train, outsource, or hire in order to execute effectively. A plan on paper means nothing. It’s execution that turns a marketing plan into a game changer.